Last week’s impromptu visit by (Fulbright student) Amanda Bernhard and her husband Jonathan Kennedy was a most welcome excuse to visit the Cobblestone! 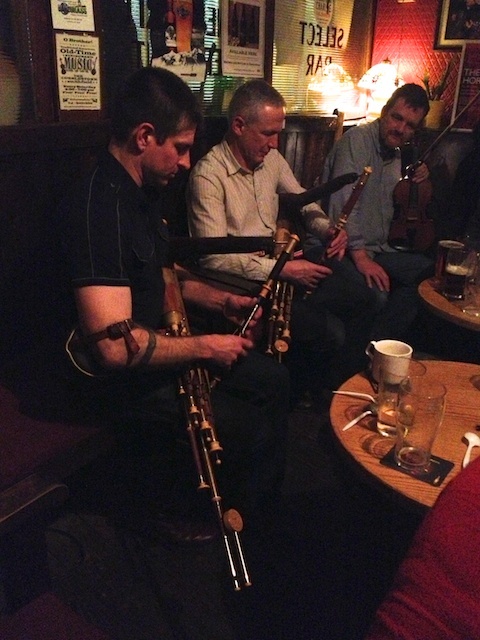 Jonathan Kennedy playing uilleann pipes with an Irish man he has played pipes with the United States. 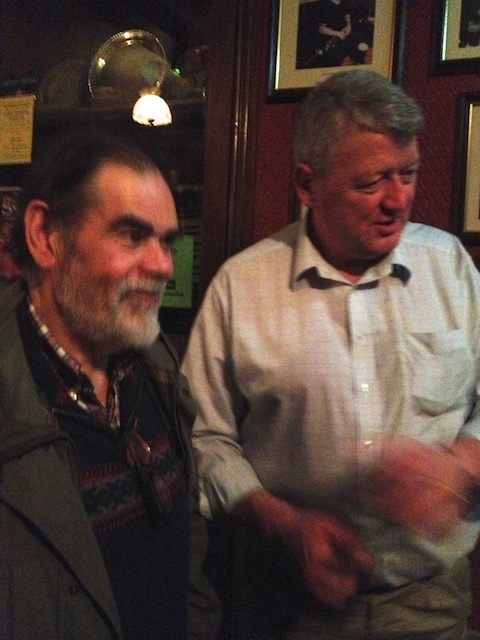 A casteen player with Tom Mulligan. Tom’s doing his best to keep Irish traditions alive and thriving here in Dublin. My friends arrived late in the evening Thursday after a day of Irish classes followed by a cross-country drive. They took me out for dinner at L. Mulligan. Grocer then we popped back to my apartment to fetch their instruments and retraced our steps one block to Tom Mulligan’s Cobblestone pub. The last two times Jonathan and Amanda went to the Cobblestone I wasn’t with them (they were staying at my apartment while I was away). They went on weekends and the musicians’ corner was already full. They didn’t play then, although they did introduce themselves to Tom. Last Thursday, however, they found space to play alongside the Irish musicians. We had a great time and enjoyed meeting new people, seeing Tom, and catching up on recent events. After talking with Tom, I finally understand how Fergus Whelan came to have close friends on both sides of the “Troubles.” He is/was both Protestant and Republican (though today he’s a peacemaker as per my earlier blog). Protestants are typically associated with the other side — usually sticking with the Queen, so to speak — while Fergus apparently supported the unification of Ireland and Irish rule for the entire island. See how much like the American Civil War it all was? As a Virginian, I too had family on both sides of a bitter conflict. And some tensions run high on that conflict even today…. Jonathan Kennedy playing uilleann pipes. The musicians were winding down for the evening. Amanda Burnhard got the chance to chat with Tom Mulligan at the end of the evening.